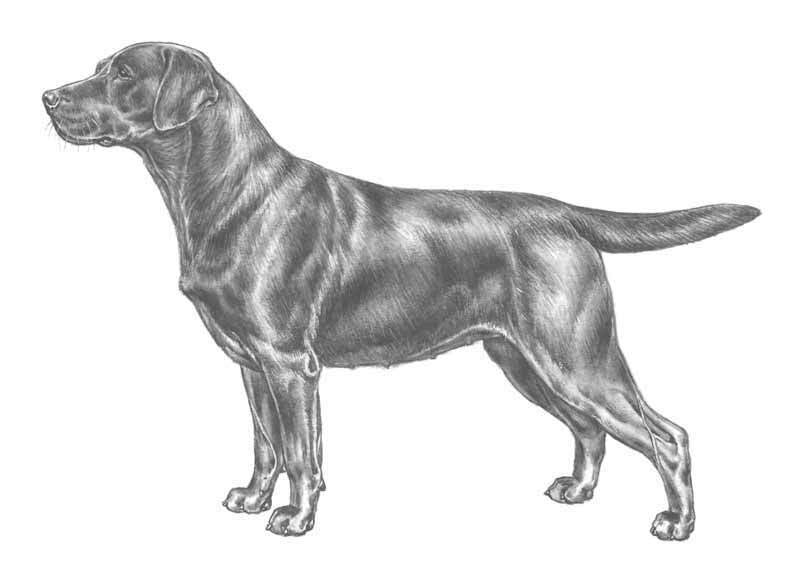 : It is popularly thought that the Labrador Retriever originated on the coast of Newfoundland where fishermen were seen to use a dog of similar appearance to retrieve fish. An excellent water dog, his weather-resistant coat and unique tail, likened to that of an otter because of its shape, emphasise this trait. : Strongly built, short-coupled, very active; (which precludes excessive body weight or substance) broad in skull; broad and deep through chest and ribs; broad and strong over loins and hindquarters. : Good-tempered, very agile. Excellent nose, soft mouth; keen lover of water. Adaptable, devoted companion. : Broad. Clean-cut without fleshy cheeks. : Wide, nostrils well developed. : Jaws of medium length, jaws and teeth strong with a perfect, regular and complete scissor bite, i.e. upper teeth closely overlapping lower teeth and set square to the jaws. : Medium size, expressing intelligence and good temper; brown or hazel. : Not large or heavy, hanging close to head and set rather far back. : Clean, strong, powerful, set into well placed shoulders. : Wide, short-coupled and strong. : Of good width and depth, with well sprung barrel ribs­ – this effect not to be produced by carrying excessive weight. : Distinctive feature, very thick towards base, gradually tapering towards tip, medium length, free from feathering, but clothed thickly all round with short, thick, dense coat, thus giving “rounded” appearance described as “Otter” tail. May be carried gaily, but should not curl over back. : Forelegs straight from elbow to ground when viewed from either front or side. : Forelegs well boned and straight. : Round, compact; well-arched toes and well developed pads. : Well developed hindquarters, not sloping to tail. : Hocks well let down. Cowhocks highly undesirable. : Free, covering adequate ground; straight and true in front and rear. : Distinctive feature, short, dense, without wave or feathering, giving fairly hard feel to the touch; weather-resistant undercoat. : Wholly black, yellow or liver/chocolate. Yellows range from light cream to red fox. Small white spot on chest permissible. Males 56 – 57 cms. Females 54 – 56 cms.